The infra-red and macro images above highlight dark coloured marks on the interior of trough 51.1935 consistent with scorching of the wood. These markings suggest that the object was used for hot stone cooking. In this technique stones heated in a nearby fire are added to a liquid within the vessel. The stones are continually retrieved, reheated, and returned to the liquid until it reaches the desired temperature. The distribution of pores or vessels is visible in this transverse section. While not diagnostic in isolation, the vessel distribution can aid species identification. In this sample the pores appear as radial multiples or groups. The distribution of pores or vessels is visible in this transverse section. While not diagnostic in isolation, the vessel distribution in combination with other features, can aid species identification. In this sample the pores appear as radial multiples or groups. The eyelash-like feature at the centre of this image is known as a sclariform perforation plate. These features are found in only four native Irish tree species- Alder, Birch, Hazel, and Holly. The number of individual 'bars' on each sclariform perforation plate is diagnostic of tree species. The number of individual 'bars' on each sclariform perforation plate is diagnostic of tree species. The number of bars visible in this image exceeds what we would expect for Hazel (5-10 bars) and indicates that the sample is either alder or birch wood. The small and numerous holes visible in the structures in this image are called pits. The pits facilitate movement of metabolites between ray and vessel structures in the living plant. The size and number of pits visible in this image is consistent with Birch or Alder wood. The small and numerous holes visible in the structures in this image are called pits. The pits facilitate movement of metabolites between ray and vessel structures in the living plant. The size and number of pits visible in this image is consistent with Birch or Alder wood. Note the sclariform perforation plates in the bottom left of the image. While this object is identified as being made from Hazel (Scannell, 1980), the method of identification is unclear. A small sample of wood was collected from the underside of losset 1938.9734 (see annotation 1 on the model above) so that the initial identification could be confirmed. This object was carved from a large tree trunk, with the long axis of the object aligned with the longitudinal axis of the tree. Given the orientation of the object in relation to the tree trunk from which it is formed, the sample was collected from a region of wood that contains some of the 'newest' growth rings available for this object. In addition, as the sample location corresponds with a split in the wood on the underside of the object, collecting the sample from this region has minimised the visual disruption to the object. A sub-sample was cut into thin slices known as 'sections', and mounted for examination using a scanning electron microscope (SEM). 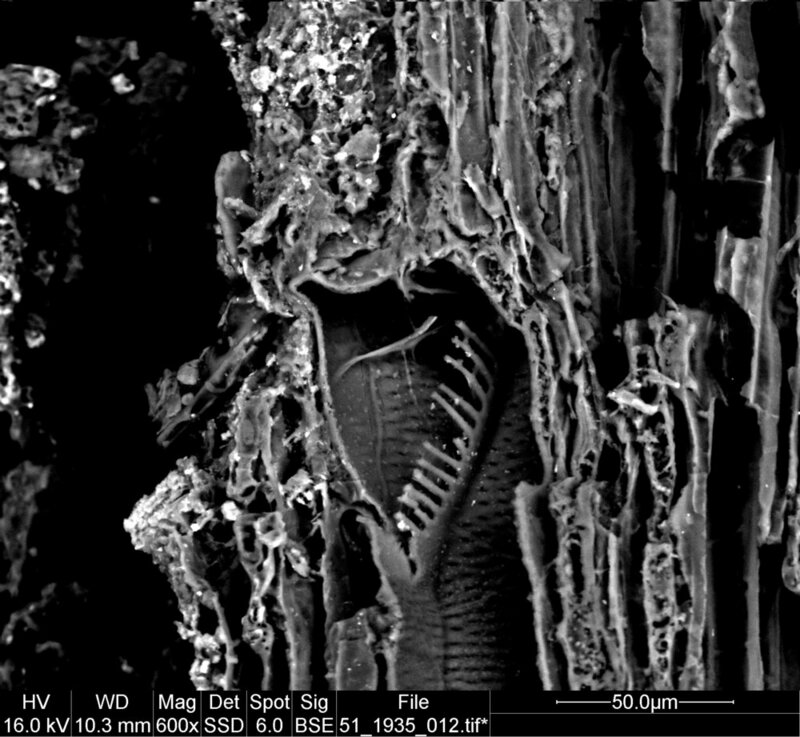 The scanning electron microscope can resolve microscopic features in the wood that help to identify the particular species of tree that the losset was made from. 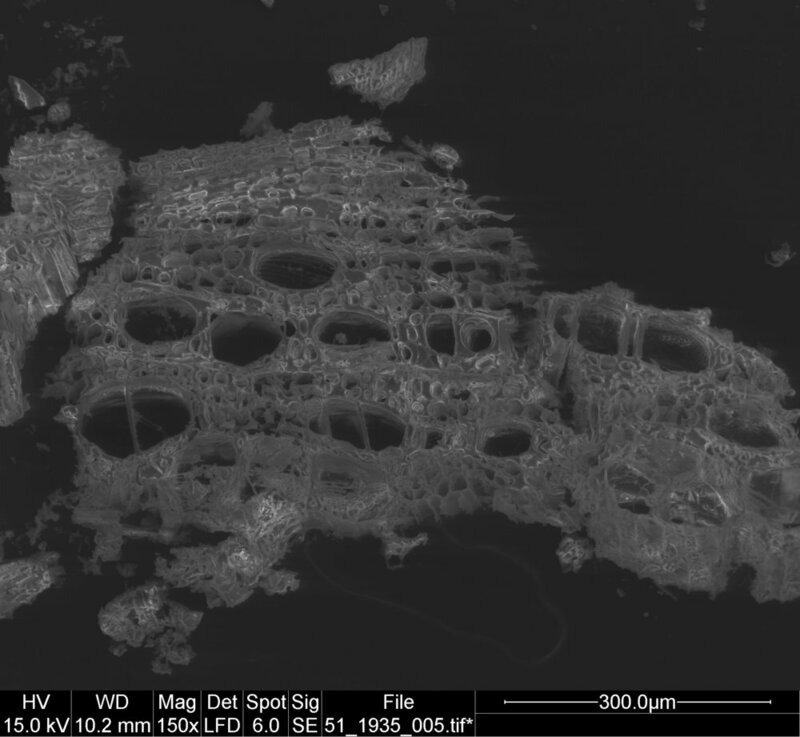 The combination of features outlined in the SEM image descriptions above does not support the previous analysis that the object is made of Hazel (Corylus), and is more likely Alder (Alnus glutinosa) or Birch (Betula pendula) wood. The number of bars on the sclariform perforation plates of Hazel wood ranges from 5-10. 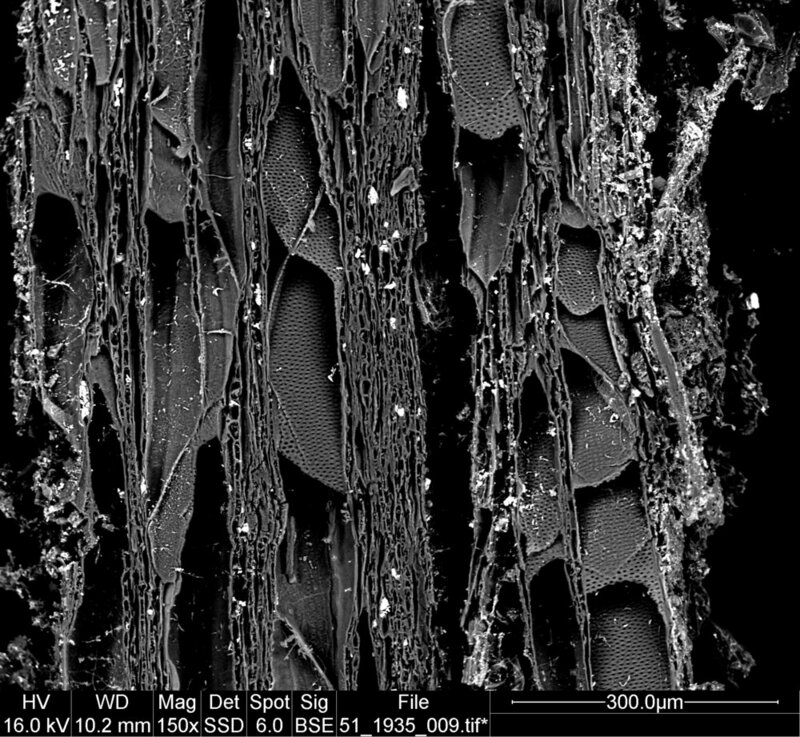 Almost all of the sclariform perforation plates visible in the SEM images above exceed 10 in number. FTIR spectral analysis showing comparison of sample collected from trough 51.1935 (blue), a reference sample for Birch (Betula pendula) (red), and a reference sample for natural gypsum (green). In addition to the peaks associated with wood, a number of addition peaks indicate the presence of CaSo4 (gypsum) in the sample. These include antisymmetric and symmetric O-H stretching bands between 3700 and 3200 cm-1, a strong SO4 stretching band between 1140 and 1080cm-1, and an SO4 bending band around 620cm-1 (Derrick et al. 1999) As gypsum is a constituent of some types of Irish peat, it seems likely that it's presence here relates to minerals embedded into the object during use or burial.